Use it for dipping, or spoon-feed yourself right from the jar. Cookie butter is more than addictive, it’s pure sin. Every oily, sweet, bite is better than the last, and it takes about a quarter or a jar to stop yourself. It’s the perfect vehicle for cannabis oil if you ask me! 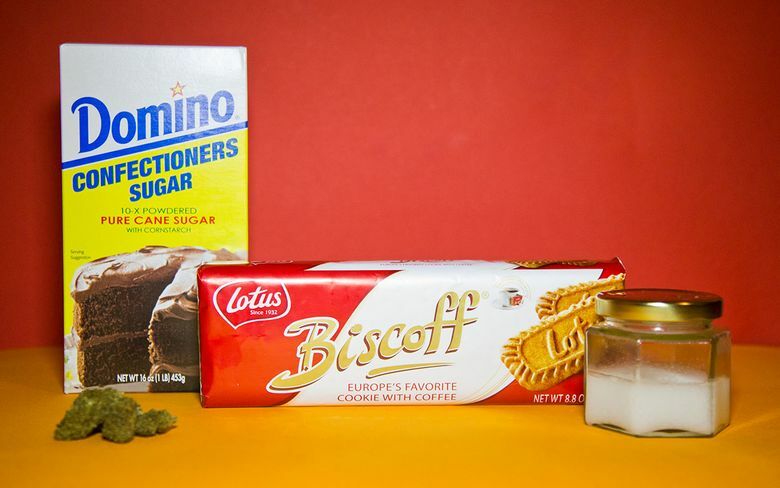 Biscoff cookies are commonly served as a snack, but ground into crumbly crunchy dust and lined with even more sugar and oil to bind it together makes for some seriously exciting medicating. Plus even though it’s dastardly levels of tasty, it’s easy to dose. Mash it up with ice cream, add to milkshakes, ice a cake with it, get wild, because sometimes this spread turns into a full-blown phase. I can usually control myself with sweets, but cookie butter is a new level of dolce. Make your own the original way, then branch out into any cookie. For this recipe, if you want to use a food processor to get more of a spready-creamy texture, go for it! If you want a cookie chunk ratio, use a meat tenderizer or a drink muddler to get fine crumbs and chunks in the mix. Make sure you really break them down so you can still spread it even if it’s crunchy. After you have smashed the cookies, mix in the powdered sugar and spices if you’re using them. Just like a cake or typical baking application, you want to mix all the dry ingredients well before adding anything wet. Mix the oils together in a separate container before drizzling into the dry ingredients. Use a spatula to mix thoroughly, doing some extra crunching with the muddler if you need to. If you have used a food processor, you may need to add water or more oil to the mix to make it really spreadable, so be careful when storing it if you add water. Once everything is well mixed, you can dispense into clean containers, or start to eat by the spoonful. Storing in a big jar isn’t recommended if you’ll be spooning it directly into your mouth, so use some smaller jars or use only clean spoons each dip! Now that you know there’s a low dose per spoonful, you can tread with caution or dive into the jar head first if you need or prefer. The gingerbread-ish zip of the cookies will keep you coming back dose after dose, so this is a great party favor or gift for a special person. Decarboxylate 3.5 grams of finely ground cannabis at 225 degrees for 20 minutes in a tightly sealed, oven-safe container. Put cannabis in lidded mason jar or vacuum-sealed bag with ½ cup coconut oil. Heat in water bath just under boiling for at least 1 hour. Strain and chill to use in recipes.